Having recently tried Syd's version of a San Fran SD, I thought it was a good time to revisit DM Snyder's very different version. When I baked it a couple of months ago, my sense of taste had been annihilated by a shocker of a head cold, so was curious to try it again now that I'm back to salivating, savouring, gluttonous normality. I thought the overproofing might be explained away by the still summerish ambient temps at that time. As anticipated, on this occasion I was able to stick closer to the proof times David used, since my temps were now so much lower. ie: BP was 4 hours, FP before retardation 1 hour, retardation was 9 hours @ 5C/40F (fridge temp recently taken). However, I found that I had to completely cut out the post-retardation final proof period, as the shaped dough was clearly ready for the oven on removal from the fridge after its retardation. In fact, it was slightly over-ready - the baked loaf showed signs of overproofing! I just sliced into some of the bread for lunch, and I must say, I was very impressed with the beautifully developed wheaten flavours - cool and almost creamy to the palate. As with the first bake, I like the textural quality of the crumb, too, which I can only describe as soft yet well structured. And the crust is crisp but not a jawbreaker, just how I like it. Very nice. Notably, though, NO hint of sourness! I don't mind at all, as I'm not a big fan of sour bread, but I do like a mild sour tang, and was expecting this of a SF style SD. I suppose my reduced final proof might have had something to do with the absence of sourness. I'm still puzzled by the proofing. Even with Syd's SF SD, which he makes in the much higher ambient temps of his Taiwan kitchen, my proof times had to be reduced to avoid over-proofing. I am well aware that fermentation and proofing times should be determined according to the dough, not the clock, and this has long been my modus operandi. Still I wonder, though, why at my kitchen temp of 21C/70F, my fermentation and proof times inevitably need to be reduced from those specified in recipes where ambient temps are around 24C (or in Syd's case, considerably higher). Manic starter? Seems far-fetched. Flour qualities? Maybe...but wish I could get a definitive answer. Any other suggestions, folks? Here are a couple of pics of today's bake of David's SF SD, which show unmistable signs of overproofing: limited spread of slashes, some tunnelling under the crust and bubbling on the outside, and crumb compression at the base of the loaf. I have to reiterate, however, that the eating qualities of this bread were fine indeed. I would say the tunneling was a shaping issue in my opinion. If it tastes good and can hold a piece of cheese it must be a success in my book! ...only partly shaping I reckon, Ian - if that. I might buy imperfect shaping re the mousehole, but there are too many other signs of overproofing to dismiss it as the main culprit. 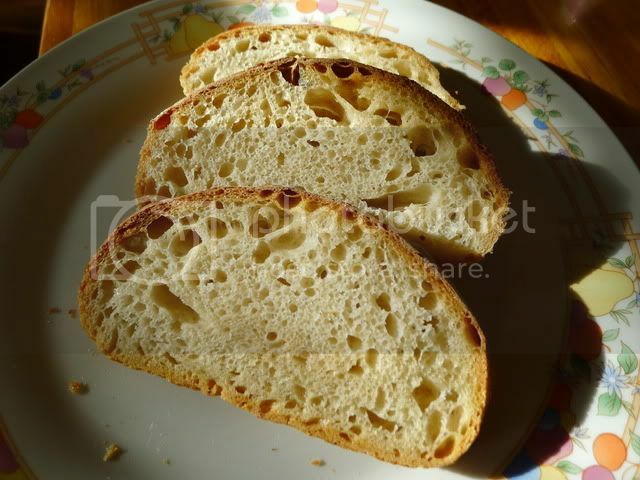 eg: the crumb compression at the base of the loaf and the lack of spreading of the slashes. I'm afraid I've overproofed too many loaves not to know the symptoms! I have no doubt that if I'd given the dough any time outside the fridge after the retardation, the overproofing would have been far more evident. As mentioned in my post, there are many obvious differences between David's bake and mine, but nothing that satisfactorily explains why my dough should be more than ready after the retardation, whereas his required 3 more hours proofing @ 85F! My main source of bewilderment is the fact that my breads seem to take less time to proof than would appear usual. looks wonderful and the top crumb shot too! Interesting how we all have to make changes for climate's and flours..but that's what makes our breads uniquely ours! Thanks for you comment, Sylvia. 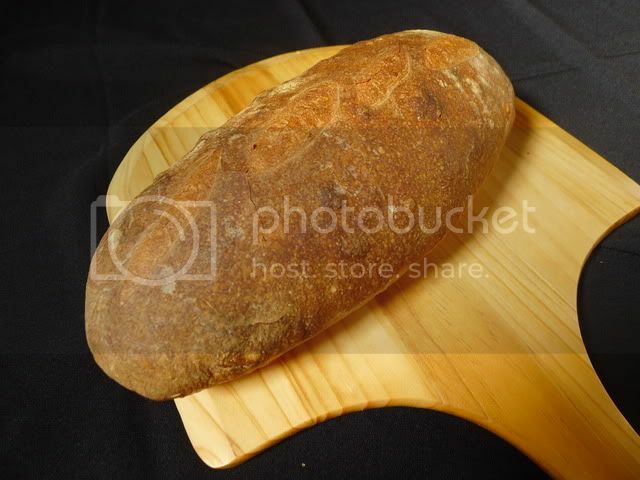 First off, your bread looks pretty good. If you hadn't said you felt it to be over-proofed, I would have guessed it was under-steamed. Anyway, I'm happy the flavor pleased you. So, here I am, on my lunch break, checking TFL while munching on a Toscano Salami sandwich made with the sourest tasting of my SF-type Sourdough series. Now, it's been frozen for about 4 weeks. The crumb is drier than when it was fresh, but not bad, and the flavor is wonderful. It's really not very sour at all. The flavor is probably very much as you describe that of your bake. I really, really like it! I've been trying to think of reasons your starter might ferment faster than any other on record ... well, at least mine and Syd's. Besides the obvious, like ambiant temperature, and the probable but not readily measured, like flour characteristics and microbiology of our levains, I though of one other variable: Dough temperature. Unless otherwise specified, I mix my doughs with very cool water. I confess to not measuring dough temperature at the end of mixing, but I wonder if my dough is cooler (at a lower temperature) than yours, at least at the beginning of bulk fermentation. Thanks for your interesting observations, David. I hadn't thought of under-steaming as a factor, but I doubt that's it. I used the same steaming method as for all my SD breads (Sylvia's microwaved wet towel strategy + two initial bursts from a spray bottle during the first 5 minutes of the bakes). Has always been adequate, I believe. Certainly, steam billows out into my fizzog and fogs up my specs if I forget to remove them when taking the steam source out of the oven after the first 15 minutes of a bake. I really, really like this bread, too. In fact, I'm planning to use the same process with some of my other favourite breads, to see how the flavours/qualities are affected. I wonder how much the genuine - and extended - autolyse has to do with the flavour development. So many recipes direct that an "autolyse" be done with the starter included in the mix, holding only the salt back. In my understanding, a bona fide autolyse is as per this recipe of yours. Dough temp is a good thought. I don't have an appropriate thermometer to measure this, but I do use filtered water from a Brita jug, which seems pretty cool - I suppose it has to be room temp (21C at the moment), but it feels colder. Whatever, it is nowhere near as cool as your fridged water. Maybe I should get a thermometer and test the dough temp theory. At least it's a measurable factor. I haven't read "Le Gout de Pain," but I have the extensive collection of videos Prof. Calvel made at the CIA in New York. 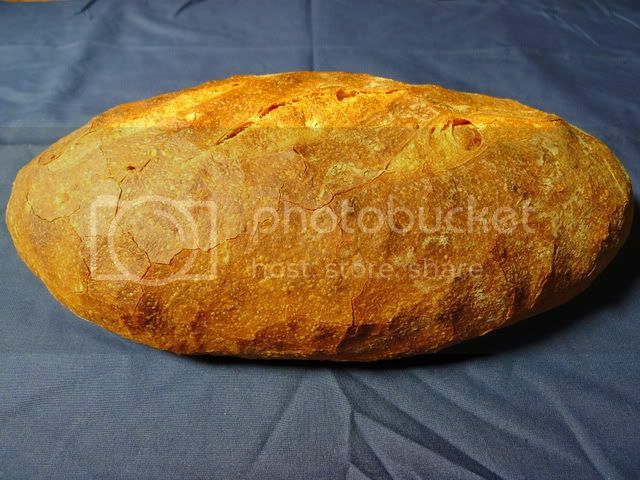 He "invented" the autolyse as a way of decreasing the need for intensive mixing, primarily of baguettes. He held out the pre-fermented dough along with the yeast and salt until after the autolyse. However, his pre-ferment of choice was a pâte fermentée which had exactly the same make up as the final dough. The current practice with sourdough breads is to hold out the levain when it's a firm levain. However, when you use a liquid levain, because it has a substantial proportion of the water in the final dough, you mix it in with the flour and water of the autolyse, holding out only the salt and, if you use it, the commercial yeast. I also bet that starter maintenance is a factor here: Even though you kept yours for a short intermesso in the fridge, it will come out kicking and ready to lift dough quickly if it's maintained regularly at room temperature and feed twice a day when it's not stored in the fridge. A sourdough that's taken out of the fridge, given a feeding or two, then jammed back in for a couple of weeks will take a lot longer to get fully going when it's mixed in a dough. David's comments above regarding autolyse is spot on: Only when the preferment is liquid (and containing much of the overall dough hydration) should it be mixed in with flour and water prior to the autolyse. The dough would likely be impossibly dry and tight if a very liquid preferment was left out of the equation. Ideally, one should not add neither salt, yeast or preferment prior to the autolyse. Salt will tighten the gluten network, and the acidity of the preferment will enhance dough strength. The main aim of the autolyse is to create extensibility in the dough, so an excess in dough strength is not desired at this stage. Adding yeast should also be avoided, as the fermentation will kick start when there's no salt present. Thanks for your comments, Hans. I've been baking three times per week + as usual, just not blogging much. Partly laziness, partly that I have already shared most of my favourite self-developed creations here, and am currently in a phase of trying out more of other folks' recipes. I'm especially interested in those that deviate significantly from my usual procedure. Thanks a lot for the extra info on autolysing. Your reasoning makes perfect sense. I think that you have probably now identified the most likely reason for both Ross and I finding exactly the same things happening during the making of this wonderful tasting bread. When I read Ross' original thread it was almost like he was reading my mind as I agree with absolutely everything he found/said. I even had to dispense with the 1 hr FP before retardation in bannetons for both versions 4 and 6. I was trained, and am used, to mixing dough to a final temperature of about 25C/78F and now understand that your use of very cool water will result in a much lower initial dough temperature than mine/Ross', reflected in longer fermentation/proofing times at ambient temperatures in UK similar to those in your home. I also "Go with the dough" rather than the clock and am guessing that your timings fit in with your particular personal schedule. I am not technically knowledgeable enough to be sure what effect this has on the flavour profile. I am now happier in understanding what (Probably) happened the first few times I made these breads. David, do you use cool water throughout, for stock activation/stiff levain production as well as Final dough production - Or just at the final dough production stage? I will try them again using cool water and report back on any differences I find - Particularly in flavour. I use cool water directly from a filtered dispenser in the door of my refrigerator. I use it for convenience and consistency. (Tap water is chlorinated.) My understanding of the "DDT" concept is that this helps standardize fermentation times. Since I am not on a commercial production schedule, I'm comfortable going with the observed fermentation rather than needing the fermentation to comply with my time. In general, a longer fermentation (within reasonable limits) means better flavor. I am more disturbed when fermentation is going too fast than when it goes slower than expected. When I am bound to a schedule and when I am using a levain right out of the fridge, I do use warm water. I also tend to use warm water for rye breads which have a large proportion of pre-fermented flour and a very short bulk fermentation. There are exceptions to every generalization, but this is my usual practice. I'm interested in hearing how your bread turns out, if you do try mixing with cool water. I think David might have hit the nail on the head here. I don't measure dough temp either, but all my doughs are hand mixed so they will be at a lower temperature than doughs that are kneaded in a mixer. While I don't use cold water, I do keep some of my flours in the freezer and this will also contribute to a lower dough temp after mixing. Finally, because of the higher temperatures over here, if the air conditioner is on, I use it and that also slows down the bulk ferment and final proof. The only other thing I can think of is, perhaps, the different way we maintain our starters. Mine is kept in the fridge and is only refreshed once (sometimes twice) a week. I know that if I keep it out of the fridge, it would be far more vigorous but that would mean I would have to feed it every four hours which, of course, is impossible. Thanks for your thoughts, Syd. I hand mix all my doughs, also, so we have that in common. Your freezer-stored flours could well be a differentiating factor - I keep mine in containers in a cupboard. I think your airconditioned temp would now be higher than my current kitchen temps, so that probably more than offsets your colder flours! Jeez: one step forward, one step back! Yes, big difference in our starter maintenance. I generally feed mine every 8-10 hours at this time of year (less as winter arrives and the temps drop further, much more in summer). For this bake, my starter had been in the fridge unfed for a couple of days, but was still aerated and mildly bubbly when I used it to build David's firm starter (which I fermented at room temp for 17 hours, an hour longer than David's). 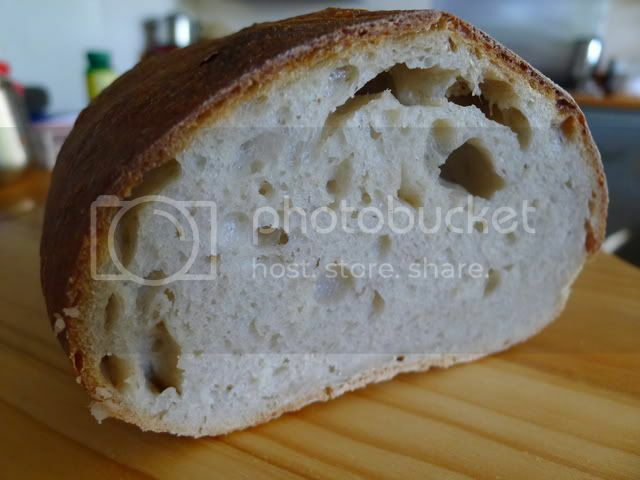 For your SF bread, I used a fully ripe regularly maintained starter at room temp. So, starter ripeness may be a factor. Are you still using the Eden Valley flour for these breads? They are a stone milled white flour which I find makes a big difference to the fermentation rates and flavour. I would start there perhaps ... it has been a long time since I have used them though. Those dough temperatures are an important thing to know. Even if you don't bother measuring water temperature its handy to know the dough temps ... helps with decision making down the fermentation track ... so to speak. I haven't been using the Eden Valley flours for some time, just because I've been trying out other flours and flour combos. I revisited Laucke Wallaby flour for some months, and concluded it is a bit over-rated. I know everyone raves over it, but I can only speak as I find. Good, to be sure, but not better than some of the others I use in terms of the flavour and texture of the finished bakes. This might surprise you, but the white flour I'm currently using is as good as any I've ever tried, including the Eden Valley. It's the one I've long evangelised about for pizzas: Allied Mills 'Superb'. Cheaper than any others I know, since it's a commercial bakers flour you have to buy in bulk from the wholesaler. Unbleached, no additives or nasties (I wouldn't even have contemplated it, otherwise), and behaves admirably! I assume it's machine-rolled. It's got a creamy tint to it visually, which I find most appealing! Made from local WA wheat, I believe. Silly, I've been using it for pizzas for a couple of years now and have always been extremely impressed with it in that context, but never thought to try it in breads until relatively recently! Doubtless, it doesn't compare with your marvellous fresh-milled flour - what does amongst the pre-grounds? - but if you're interested in trying out any pre-ground white flours, do give it a go. I'd be most interested in your assessment. Since you're clearly an exceptional home baker, I take careful note of your observations. If you say it's important to know dough temp, I accept that. I assume you record this among the details when you're taking notes on process as an aid to getting fermentation spot on? I take notes, but just on things like fermentation times and ambient temps, and results. Then I ignore them next bake, and go by dough feel! Not always very adroitly, I might add - my proofing is not always right, tending to go over the ideal rather than under. This inconsistency is an aspect of my baking I'm pissed off with. I figure I should be better at assessing dough-readiness by this stage, although I think baking straight out of the fridge after an overnight retardation does wrest control away from the baker. The overnight retardation suits my schedule, but I suspect denies me the fine-tuning at the final proof stage that might yield the consistency I am after. I guess I'd better get in my jallopy and buy me a thermometer! This is pathetic, but I've stood before the bewildering array of thermometers at Kitchen Warehouse on several occasions and walked out not knowing which type to buy. The staff seem as bewildered as I am! It's clear that they're only guessing when I seek their advice. May I ask what thermometer you use?